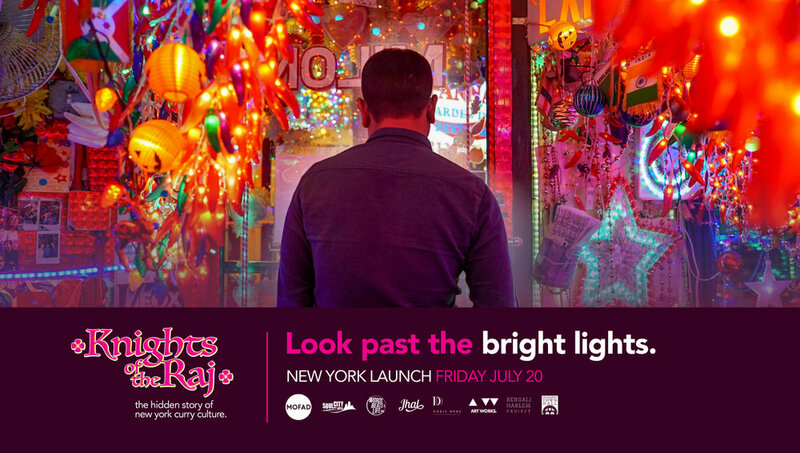 Knights of the Raj NYC was an immersive after-hours exhibition and dining experience on show at MOFAD Lab from July 20 through August 5, 2018. Presented in partnership with Mohammed Ali, Soul City Arts, and Words Beats & Life. With special thanks to Jhal NYC, the Doris Duke Foundation for Islamic Art, the National Endowment for the Arts, Bengali Harlem Project, and Flushing Town Hall. Following a ground-breaking exhibition on the history of curry in England, Mohammed Ali debuted a new Knights of the Raj experience at MOFAD in the summer of 2018. With a focus on New York City—home to about half of the nearly 60,000 Bangladeshis, the fastest growing Asian American subgroup, living in the United States today—Knights of the Raj NYC captured the struggles and stories behind the people who brought curry to New York City restaurants, and invited visitors to experience South Asian flavors while absorbing the deeply personal narratives that led Bengali migrants to New York. Visitors looked past the bright lights in a recreated Curry Hill restaurant, heard the deeply personal narratives of the Bengali migrants who cook and serve curry, learned about Bangladeshi culinary techniques, and enjoyed a three-course tasting menu of traditional recipes donated by chefs and home cooks in the local community. Feasts and Festivals was a photography exhibition and program series in partnership with SAVEUR presented by Roland Foods on show from November 6, 2017 through February 16, 2018. Featuring talks, demos, and special events, Feasts and Festivals examined food and drink’s central role in celebrations, ceremonies, and rituals across the globe. Feasts and Festivals debuted never-before-exhibited professional photographs of annual festivities, religious rituals, and special occasions from the SAVEUR archives. Photographers include Dave Yoder, Diana Markosian, and Marcus Nilsson, among others. The accompanying program series featured talks, demos, and special events with Jim Lahey, Ruth Reichl, Sri Rao, the Mexican Cultural Institute, League of Kitchens, and many more. “Feasts and Festivals will encourage thoughtful conversation around the many ways that food unites, but also distinguishes, communities. We are about to enter a season filled with cherished traditions at a time when the heated dialogue over identity, race, and immigration continues in the United States and beyond. That’s why I’m so excited to bring people together for Feasts and Festivals—a celebration of its own that explores themes of cultural identity, migration, and tradition through the lens of food,” said Peter Kim, MOFAD Executive Director. What is your favorite special occasion food?